On the Druk Air flight into Bhutan, I had read the inflight magazine about VAST (Voluntary Artists’ Studio) Bhutan, started in 1998 by a group of artists to provide opportunities to the Bhutanese youth to develop their potential as well as to share social responsibilities through art. I chanced upon an art shop next to my hotel. By coincidence, the owner is the brother-in-law of the key founder of VAST, Kama Wangdi, or popularly known as Asha Kama. Asha means “uncle” in Bhutanese. Even His Majesty calls Kama Wangdi “Asha”. When I met Asha, he joked that even his mother calls him Asha. I was told he conducts free art classes for children every Saturday at 2pm at the Tayarana Centre, which is near my hotel. So I decided to check VAST out today. VAST is located in a space of approximately 2,000 sqf in the Alaya Gallery. Inside, there are a number of young artists at work or chatting with one another. Completed works adorn the walls while half completed canvasses are either on the floor leaning against the walls or on art easels. 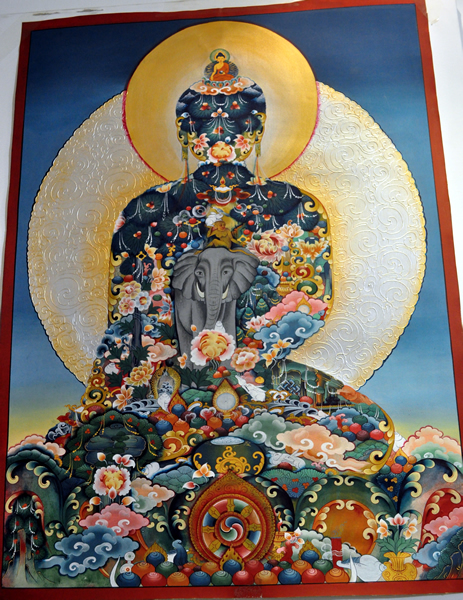 A large completed piece depicting the 4 important animals in Buddhism and Buddha. Was told a piece like this would sell for around S$600-S$800. Artist at work painting a Dzhong from a photo. 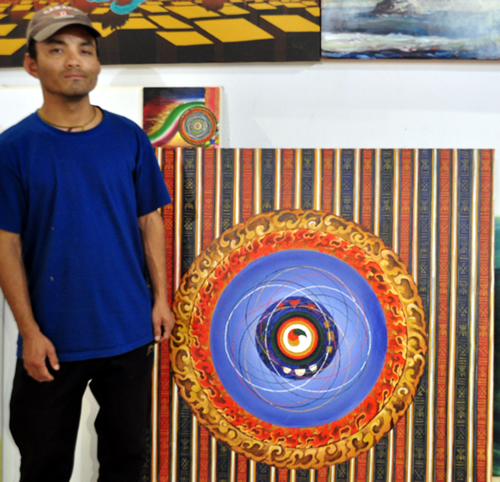 Artist Dorji Wangchuk who was a pioneer student of VAST 15 years ago. Today, he is a successful artist, having held several art exhibitions recently, including one in Taiwan last year. He has sold some 30-40 paintings so far. Artist Zuki with a semi-completed painting. She has been with VAST for 11 years since she was young. She graduated a year ago with a degree in Graphics from a Pakistan university under a South Asian scholarship. She obtained her scholarship thanks to recommendation by VAST. She has also learnt computer art and animation as a student at VAST, taught by a volunteer. 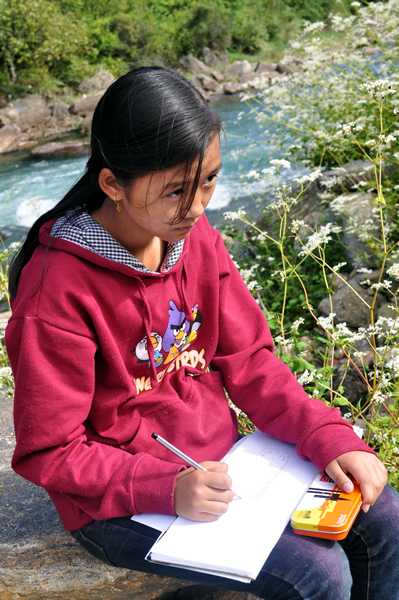 She now does contract work in graphics using computers since returning to Bhutan. The children were missing from the gallery. The artists directed me to the river bank across the road. There, I found some 20 children busy sketching away. Asha was there too, together with some of his artist disciples working with the children. Today was outdoor art. 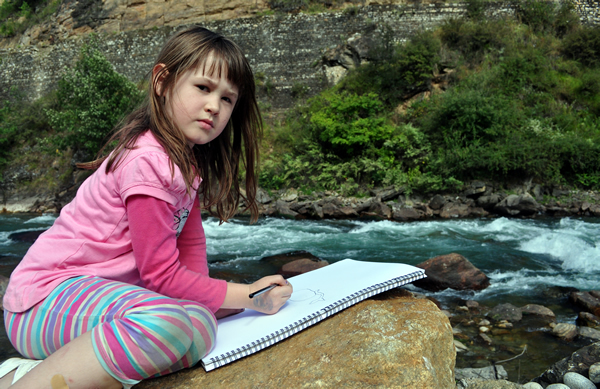 Asha has set up a structure for the kids to sketch from, or they could sketch other things around the beautiful river bank. There were even an Australian child and two Indian girls there. They were here because their parents are working in Bhutan. Asha explained that usually, there are many more children but this being close to the final school and national examinations, the older children were busy preparing for their examinations. Lessons are totally free. Parents can donate to VAST if they wish to. 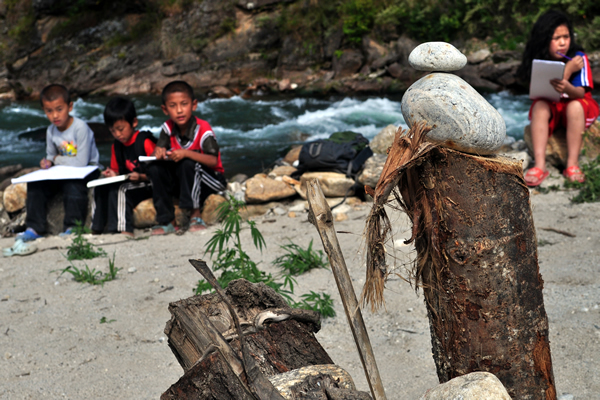 Children concentrating on sketching the structure Asha had created by the river bank. 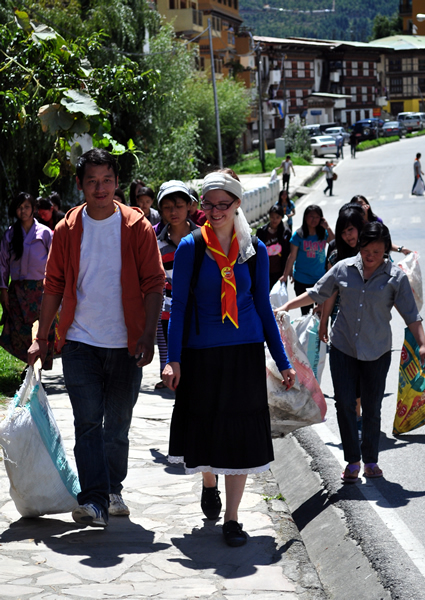 Young Australian girl who had accompanied her mother, a volunteer to Bhutan for 2 months. We adjourned for tea with Asha and his artists at the Alaya Gallery. Asha, 55, told his story. He started his career as a graphics staff with the government in 1976. For 10 years, he tried many ways to go abroad to study art. He finally received a scholarship to study art at the University of Kent in UK. Upon his return, he worked for another 2 years in the government until his department was closed down and he became a full time artist. It took him a long while to get his art accepted and to sell his pieces. 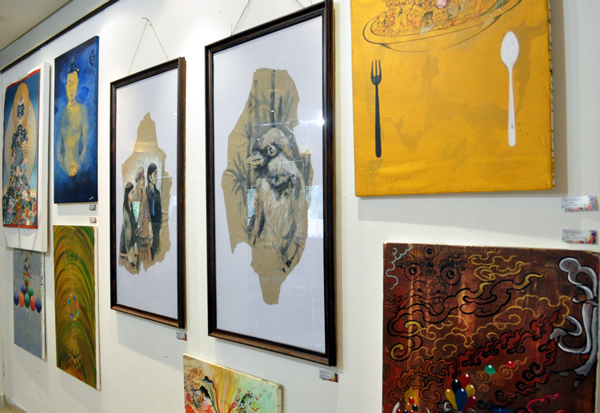 He held his first solo exhibition only 2 years ago, in 2011. VAST is a non-profit initiative. Rental for the premises is currently paid for by His Majesty. 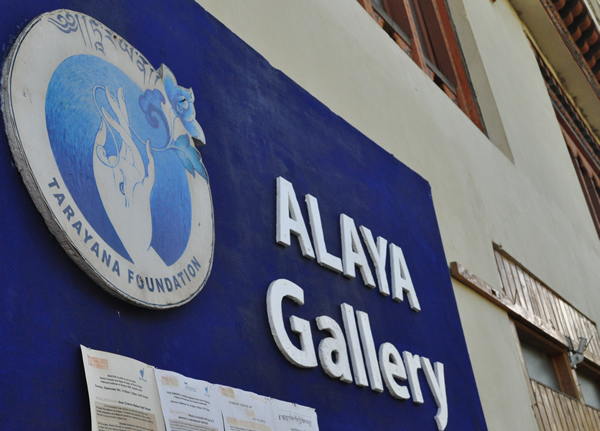 Artists pay a nominal 1,500 Nultrums (equivalent to S$30) a year for access to Alaya Gallery any time (except Sunday, a rest day). Asha explains that the amount is barely enough to pay for utilities and to keep things going. 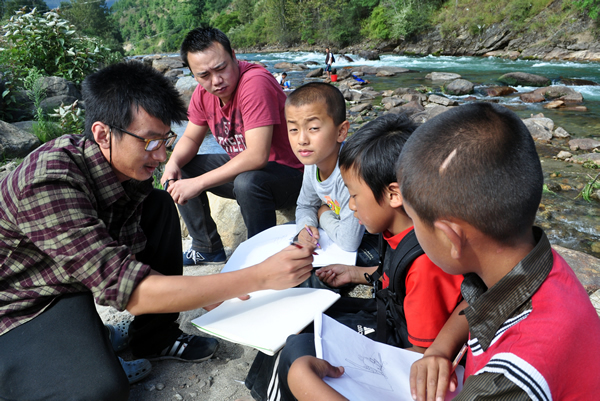 Asha and 3 of his pioneer students, Pema, Dorji and Maiyess, all full time artists now. Another pioneer student and full time artist, Dorji Wangchuk was sitting opposite this group and was hence not in the photo. Sitting around with Asha and us for tea were 4 of his pioneer students. They all started when they were school students, back in 1998 with the formation of VAST. Today, all 4 are full-time artists and they give back their time to help train the next generation of artists. 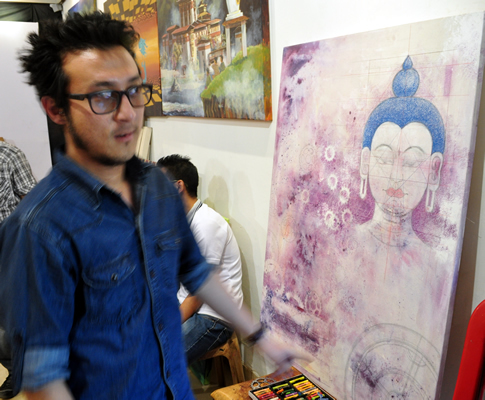 It is hard to define Bhutanese visual art. 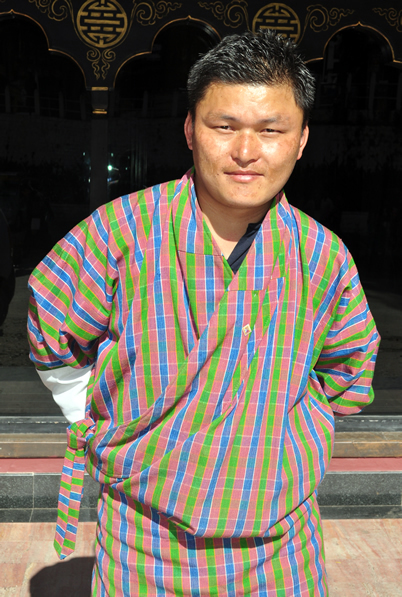 Bhutan has a long history of handicraft, made for their many colourful cultural and traditional events. 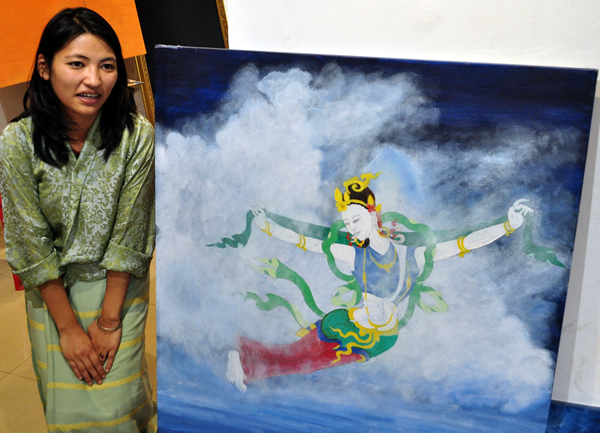 Visual art in the form of painting is new in Bhutan, with strong influence from western art styles. Glancing at the art pieces, I see each artist trying to evolve his or her style. 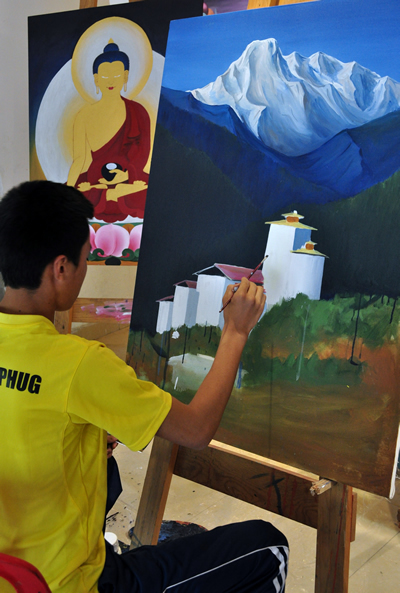 The themes for most paintings were related to Bhutan – objects, religion, places and sceneries of Bhutan. Being full time artist is an exception. Most of the other artists have day jobs and come to VAST only on Saturdays. Finding jobs related to their artistic skills is a challenge too. For example, Zuki the scholarship holder with her overseas graphics degree and IT skills, could only do occasional contract jobs after returning to Bhutan for a year. Chand is an animator. He recently started his studio with some partners but have yet to secure their first major contract. On Friday, I met the founder of an IT firm that hires seventeen 3D animators. He proudly showed me his 3D animated film and told me of his plan to make a more ambitious 3D animated film of a famous battle in Bhutan’s history. He has yet to figure how to make money out of this industry, funding his animation passion with profits from his software development and training businesses. His passion is to create animation and he has ploughed on for 3 years in this pursuit already. Yet I see their passion to follow their artistic pursuits despite economic challenges. And even with their own challenges in making a living out of art, they found time to return back to society by volunteering each week to train the next generation. Last Sunday morning, I observed a group of youths gathering outside my hotel in Thimphu, the capital of the Kingdom of Bhutan. 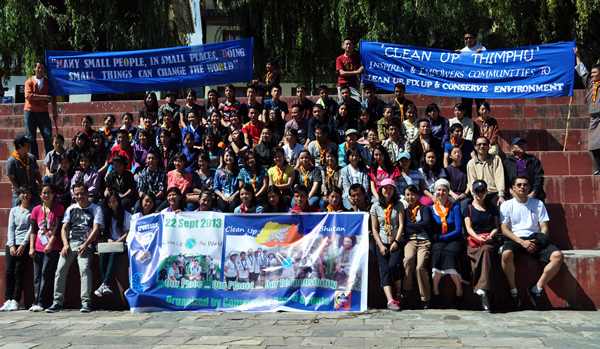 Curious, I joined the crowd and found that they were volunteers from various youth groups gathered for the Clean Up Bhutan project, which coincided with the United Nations’ Clean The World Day (21-23 Sep). 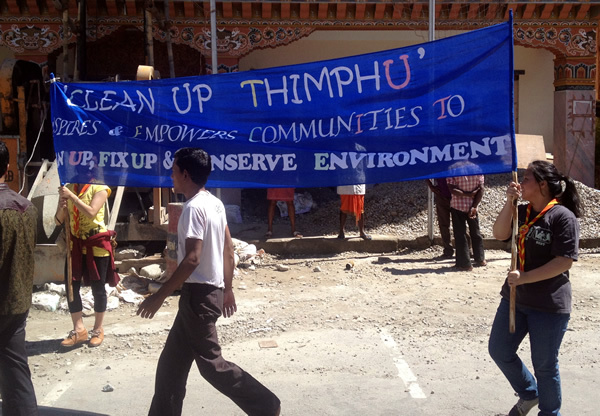 Having a free Sunday, I decided to join the group and followed them on their trail around the streets of Thimphu. 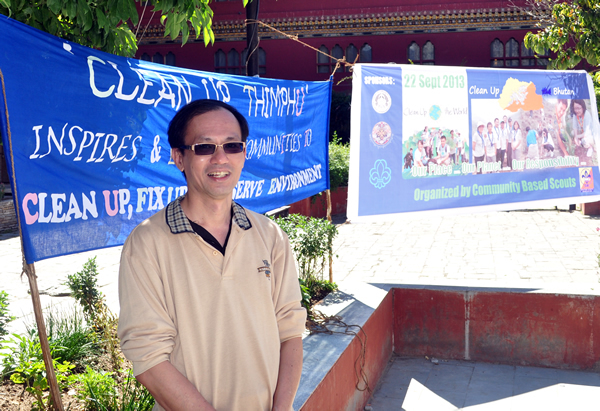 The event was initiated by Mr Dorji Wangchuck from the Department of Youth and Sports in the Ministry of Education. He wanted to mobilise youths from various youth groups together to get them to make a change in their living environment. 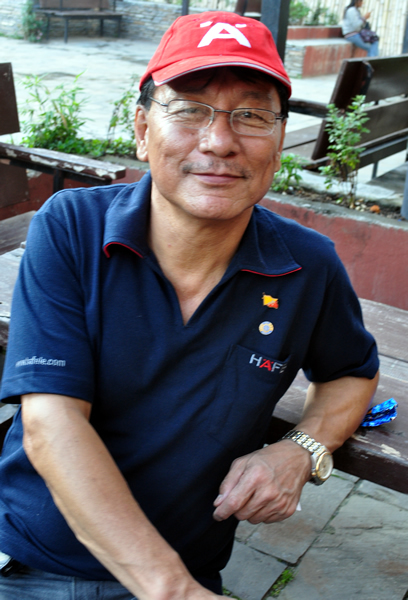 Mr Dorji was earlier working in a rural school and was the school’s scoutmaster. Frustrated that his school was often passed over for many activities because it was too remote to be allowed to participate, he jumped on the opportunity to be based in the capital to follow his passion of driving volunteerism and youth activity across the country when the post was opened up. The event started late. Apparently, the truck from the municipal that was to deliver the collection bags, gloves and tools for the clean up did not show up. Undaunted, Mr Dorji gave a pep talk and managed to move the group to get supplies donated by nearby shops to get the event going. It was already getting hot at around 10 am. 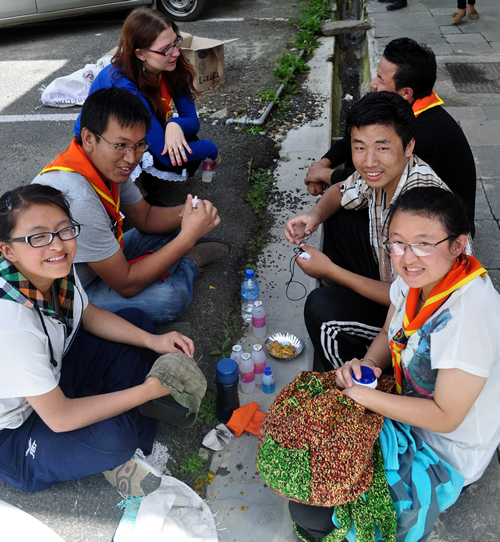 The enthusiastic youths fanned out in two groups towards two parts of the town. I followed one group. A little later, I noticed some had gloves. I wasn’t sure if those were donated by a shop or the supplies did come later. 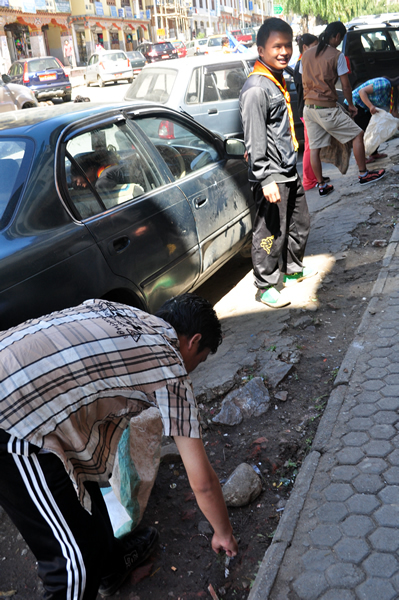 We went through around 10 km of streets zig-zagging between alleys until we reached the collection bins in the Tourism Centre where the bags of garbage were emptied before piping hot food was delivered to them in Mr Dorji’s car. Banner ladies carrying the message across town. I found that these two ladies are studying grade 12 (JC2) but are in their early 20s. They are working in the day and studying at night in community schools. When asked why, they said they realised it is important to be educated. 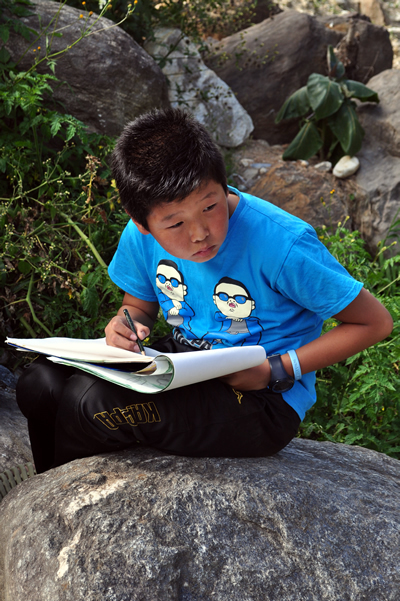 Education is taken quite seriously by many young Bhutanese. 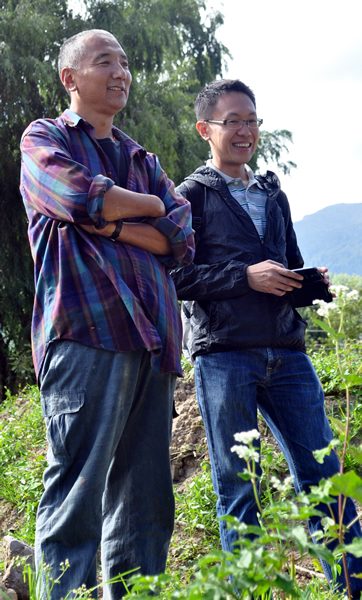 Later, I realised that the food was paid for by Mr Dorji himself. A supposed sponsor for the event did not turn up and there was no refreshments. Not wanting to disappoint the youths which may discourage them from future volunteering, Mr Dorji went to buy his own food. I heard it cost around 3,000 nultrums (Bhutanese currency, which is about $60). As a civil service officer, I figured it would cost him around 15% of his monthly salary, a substantial investment for a day in his volunteerism work. His remarkable spirit in wanting to mobilise youths for change and to spread the message that we can all do our part in improving the world around us is admirable. Later that afternoon, another group came out to the Clock Tower Square outside my hotel. I knew this group. I had met Mr Sagar Guring earlier at the Musk Restaurant in the Square where he and his friends frequent in the evenings. He had invited me to see their weekly Sunday cleaning routine for the Square using a group of volunteers. 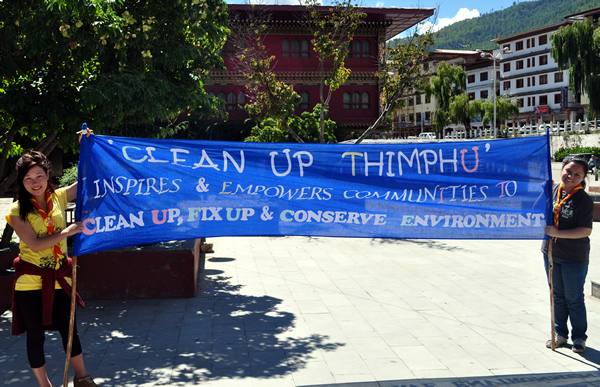 Two months ago, the owner of Musk Ms Diki and her friend, Mr Tshering Yonten (a retired top government official now in private business) were musing about the amount of waste people were putting around town, and across the country. 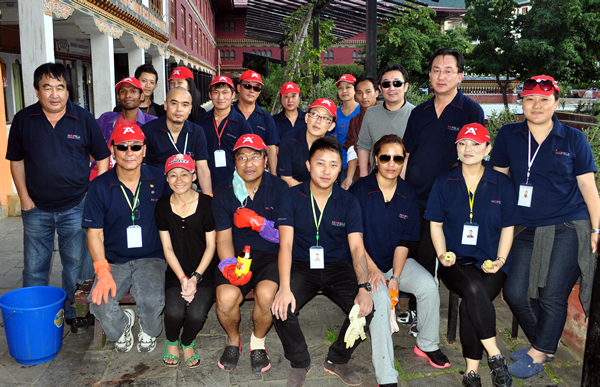 Being Green is something that is part of the Gross National Happiness (GNH) concept and even taught in schools. However, with increasing urbanisation and people forgetting what they were taught in school, garbage is being thrown indiscriminately. They decided they can do something, at least in the environment around them. They mobilised a group of friends, numbering around 15 and started a Sunday cleaning campaign around the Clock Tower Square. Theirs was a little more serious, regular and organised than the morning youth group. They have invested in brooms, gloves, pails and even made name tags for themselves. They call their group the Jurwa Club. Jurwa is the Bhutanese word for Change. Change because they wanted people to change their mentality about garbage. Change because they believe people are capable of change to improve the environment around them. This group is comprised of young adults to retired folks, all well spoken, mostly professionals and business people. After over 2 months, there is currently over 20 people turning up each week, depending on whoever is available. Most make it a point to keep this Sunday afternoon date. 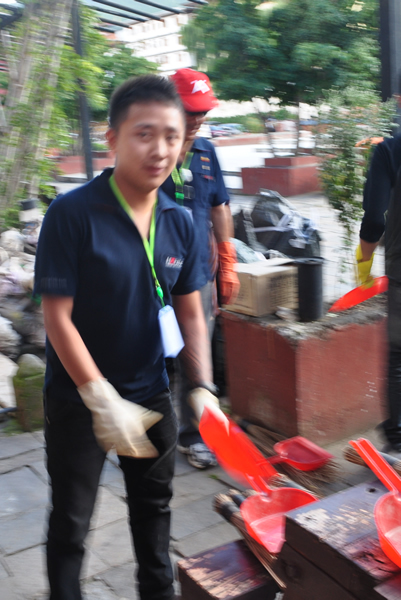 Being more experienced professionals, some with media background, they were able to mobilise the media to cover the event to drive home the message to the rest of Bhutan that each should initiate change to take care of the environment around themselves. 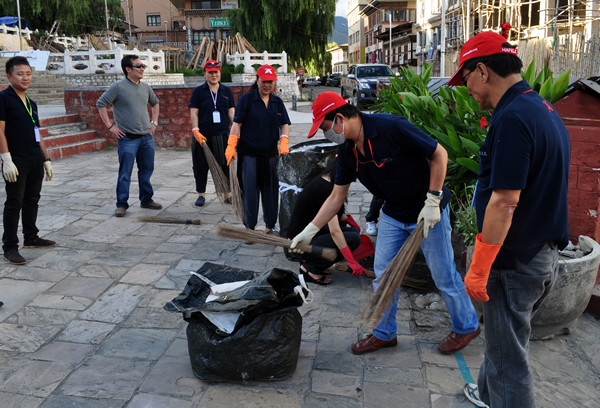 With better tools, they go about cleaning up the tougher dirt and garbage around the Square. An hour later, all hot and sweaty, they completed their task. Tools were returned, washed and stored up for next week’s cycle, and the group were rewarded with tea and cookies from Musk restaurant. 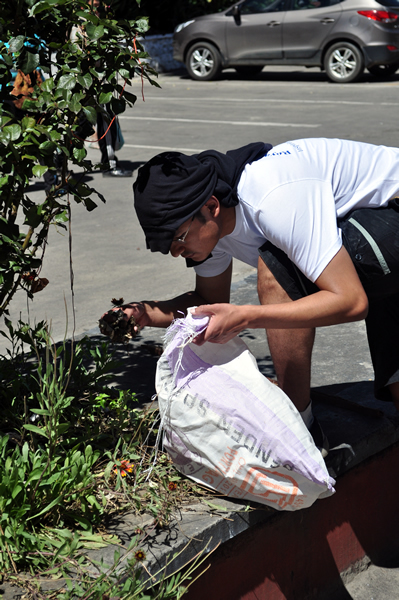 In observing these two clean-up events, I was reminded of the many “Use Your Hands” and cleaning campaigns I had gone through as a student in school decades ago. Our campaigns too were to drive home the message of the importance of cleanliness and to do our part (use our hands) to make things happen. I recall once while in Junior College, some from our class initiated a night hike across Pulau Ubin island. We trekked through plantations and reached the northern end of the island when it was pitch dark and camped there for the night. The next day, we packed up to go. Some of us had left their rubbish behind in the deserted beach. One of the group members picked up the rubbish and carried these with him. The nearest dustbin must be at least 5 km away, back through the plantations we had trekked through. No one else would know we had put rubbish in the beach if we had done so. Yet this member reminded us that we should handle our waste properly. So everyone picked up every bit of waste that we had created on the beach and carried them till we came to the first dustbin miles away. I can still remember this till today because it was a powerful message sent by one member to the rest in the group that we can take control of our environment. We can choose to keep it clean. We can choose to change and inspire others to change. Never underestimate the power of a few to inspire others to change by your simple actions. Jurwa – for a better world. Yesterday, I attended the wake of long-time WP member, Mr Ng Ah Chwee. He had passed away on Tuesday at the age of 66 from heart failure due to complications from various ailments. I first met Ah Chwee a few weeks after I started ground campaign in Joo Chiat for GE2011. I was then a newbie in the Party. Everyone in the Party was busy with their own campaigning. Ah Chwee had volunteered to help on my campaign. He had been the elections manager for Dr Tan Bin Seng in 2006, who had also contested in Joo Chiat SMC. Ah Chwee was already in poor health when I met him, having been diagnosed with diabetes and kidney problems not long before then. Yet he insisted on helping whenever he could, when he was less unwell. Along the way, I found out that Ah Chwee had been a long-time member of the Barisan Sosialis, which he joined after leaving secondary school in the 1960s. He would have worked alongside Lim Chin Siong and company. I later heard he helped as a volunteer for JBJ in the 1980s. When Barisan Sosialis merged with The Workers’ Party, Ah Chwee became a WP member. He became the Organising Secretary of WP from 1992 to 2006, during what would have been difficult years for the Party. The Organising Secretary plays a key role in a political party, often directing campaigning activities and logistics before and during elections. He stepped down in from the Party’s Central Executive Committee in 2006 in an exercise that saw many young members take over the Party’s leadership. What struck me about Ah Chwee was his keen desire to help despite his failing health. He had decades of political experience yet he did not impose any of his views on me. He would share with me what he had done during the 2006 GE campaign when he was Elections Manager for Joo Chiat SMC. I would listen and decide what I could use, but I would run the campaign the way I was comfortable with. Ah Chwee was happy just to come along, introduce me to residents and then step aside for me to interact with them. Once, on a gruelling campaign visit at Villa Marina in Siglap, we had to cover 28 blocks of walk-up apartments on a hot Saturday afternoon. Ah Chwee insisted on coming along. After completing a few blocks, he struggled to keep pace. He slipped and fell and we arranged for him to take a cab home. A few days later, he would come back again to join on the campaign trail. Post GE, I met Ah Chwee often at Party events, at by-election rallies and at the weekly Hammer Sales. Sometimes he would show up at various Meet-the-People sessions. He came whenever his health permitted him to. He came not to interfere in anyway. He would offer help and assisted when help was needed. When help was not needed, he would cheer the rest on. I recall at a Members’ event, some veteran Party members said that they felt left out by the changes that have been taking place. Ah Chwee stepped forward and told them that they should just come for events and make themselves useful; and if they were not needed, they can be happy that the Party is progressing. Ah Chwee certainly lived by example, doing as he had said. He made himself useful during my GE campaign despite his poor health and did not try to impose his views on anyone. He was happy to let me do what I thought was best. Whenever I look at veteran opposition warriors like Ah Chwee, I try to imagine what politics was like in their times; the turbulent 1960s, the barren 1970s, the moments of breakthrough and struggles in the 1980s, the ups and downs of the 1990s and the renewal from the 2000s. Ah Chwee lived through all that. 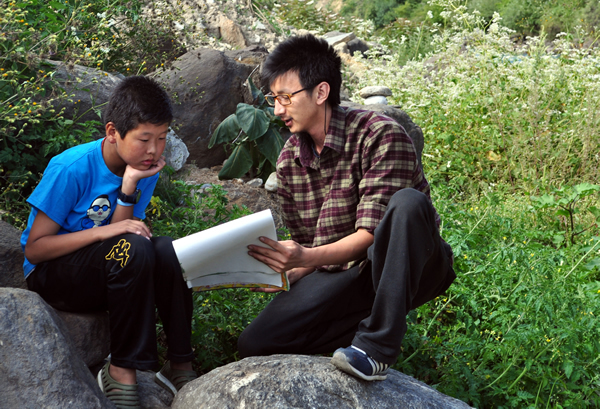 He once used a Chinese proverb, “长江后浪推前浪” to tell me why it was necessary that new people like us came forward. The phrase translated means that from the back, the new waves of the mighty Yangtze river pushes the earlier waves forward. It means that the new will come forward to take over from the old. That’s the only way progress can be made. One day in the future, like Ah Chwee, I hope I will be able to use this phrase on a new batch of younger people who can continue on the progress that have been made. Farewell my friend and comrade. Rest in peace. Mr Yee Jenn Jong asked the Minister for Trade and Industry (a) what are the results and lessons learned from the test-bedding of solar photovoltaic (PV) installations in HDB housing estates and in public institutions such as Ngee Ann Polytechnic; (b) whether the Government will scale up the experimental test-bedding to have PV installations beyond the targeted 3% of HDB blocks; (c) whether the Government will consider deploying PV installations on all government buildings and public schools; and (d) and whether doing so would set an example to the private sector for the viability and cost-effectiveness of PV installations. Mr S Iswaran (for the Minister for Trade and Industry): Over the years, we have supported various research, pilot and test-bedding programmes to strengthen our capabilities in solar PV. For example, the Housing and Development Board (HDB) is leading the $31 million Solar Capability Building Scheme, a nationwide solar pilot programme on public housing blocks. Since 2008, HDB has been progressively installing solar PV in both new and existing HDB precincts. To date, about 100 blocks have been installed with solar PV systems. From HDB’s pilot programme, we seek learning points on the feasibility and performance of various solar PV technologies in Singapore’s densely built tropical environment, as well as best practices for implementation and systems integration of solar PV. Another initiative is the Economic Development Board’s (EDB’s) Clean Energy and Research and Test-bedding (CERT) Programme, which offers opportunities for companies to test-bed clean energy technologies using locations provided by government agencies, including government buildings and public schools. The CERT programme also aims to encourage R&D and build research capabilities in solar PV in our local research institutes. Projects supported under the CERT programme include National Parks Board’s (NParks’) Gardens by the Bay, PUB’s Marina Barrage, the Building and Construction Authority’s (BCA’s) Zero-Energy Building, and installations in Singapore Polytechnic and Ngee Ann Polytechnic. Our HDB solar PV systems generate an average of 3,200 to 4,000 kilowatt-hours of electricity per month per housing block. This largely goes towards powering each block’s common services such as elevators, water pumps and corridor lights, thus reducing common areas’ energy consumption from the grid. Going forward, we will continue to support such test-bedding efforts. To meet the energy demands of government-owned buildings, we remain open to all energy technologies and options. These could include buying electricity from the grid, installing solar PV to augment electricity supply, or installing energy-efficient technologies to reduce energy consumption. The Government could take the lead in installing solar PV where it makes economic sense to do so. The private sector would similarly need to weigh the costs and benefits in deciding whether to deploy solar PV installations. The Government will continue to facilitate this by supporting technical infrastructure for better integration of distributed energy sources, and reviewing our market regulatory rules and policies. Mr Yee Jenn Jong asked the Minister for National Development (a) in which HDB housing estates have test-bedded solar photovoltaic (PV) panels been installed and how many blocks of flats does this comprise; (b) on average, how much savings have the Town Councils for these estates gained in their electricity bill ; (c) taking into account the subsidies given by the Government for the PV installations, how long will it take for the PV installations to break even on the savings achieved; and (d) whether the savings have benefited the residents directly or through rebates in the Service and Conservancy Charges. The Senior Minister of State for National Development (Mr Lee Yi Shyan) (for the Minister for National Development): Sir, under HDB’s Solar Capability Building Programme, about 100 HDB blocks have been installed with solar PV systems. These blocks are scattered in different geographical areas in about 15 locations to enable HDB to study the impact of the microclimate on the performance of the solar panels. The solar power generated is used to power the lighting at the common areas, water pumps and lift operations. Initially, the implementation of the solar PV systems was fully funded by the Government. Later on, in order to stretch the budget to benefit more estates, HDB adopted a solar leasing model to tap on private enterprises to carry out the design, financing, installation and maintenance of solar panels in HDB buildings. HDB funds a small percentage of the initial start-up costs, and the remainder is funded by the contractor. The contractor recoups its investment from selling the generated solar electricity to the Town Councils (TCs). Under this model, the Town Councils will enjoy monthly savings of up to 5% off the prevailing electricity tariff rate. To-date, HDB has installed solar PV systems at 40 blocks in Punggol through this solar leasing model. The payback period for the latest phase of the solar leasing model is 19 years. The savings derived from the installation of solar PV systems will help TCs to mitigate rising operating and estates management costs. Residents will in turn benefit, as this helps to keep the cost of maintaining the common areas low. Mr Yee Jenn Jong: Sir, I thank the Senior Minister of State for the answer. Just a quick question, whether this programme has resulted in savings in the S&CC for the residents. If not, whether it is because we are still in the pilot phase and if we have to scale this project up to a much larger scale across Singapore to get the economies of scale that will result in direct savings to residents in the fees that they have to pay? Mr Lee Yi Shyan: Sir, right now, the blocks that have the PV solar systems installed will enjoy about $500 to $800 savings per month per block. So compared to the entire block consumption, it is not a huge sum of money. That is why it is still a pilot phase. The benefit is directly accrued to the TCs. The TCs can mitigate part of the operating costs and perhaps the rising costs, so the TCs can delay adjusting the tariffs to the residents to a further date. The economics of PV solar system is such that even with some form of Government subsidy today, it would still take another 19 or 20 years. Over time, we hope that the prices of PV cells would come down. Indeed it has come down. From last year to this year, it has come down almost by half. If the cost of production of PV cells continues to go down, we hope one day the economics would be favourable to us implementing PV system on a wider scale. Having said that, we have to keep it in perspective because worldwide in most countries, if PV applications can reach 1% of the country’s overall power generation, it is considered to be very good. If it is 2% nationwide, it would be a very successful implementation. Mr Yee Jenn Jong asked the Minister for Trade and Industry (a) how many grid-connected commercial and household solar photovoltaic (PV) installations are there in Singapore; (b) what is the total capacity of these installations; (c) what percentage of Singapore’s total electricity generating capacity does this represent; (d) how much subsidies, grants, or funding-in-kind have been given for these installations, if any; (e) what schemes are available to encourage grid-connected PV installations by the private sector and households; and (f) whether the Ministry is studying the viability of Feed-In Tariffs, Rooftop Leasing, and Solar Leasing to encourage private grid-connected PV installations. The Second Minister for Trade and Industry (Mr S Iswaran) (for the Minister for Trade and Industry): Mr Speaker, Sir, as at 1 January 2012, there were 157 grid-connected solar PV installations in Singapore with a total installed capacity of 5,546 kilowatts peak (KWp). This is almost three times the capacity compared to end of 2009, and it represents 0.05% of Singapore’s total generation capacity. Our principle is to price energy correctly. The right price signals will help to ensure greater energy efficiency and conservation. Hence, we do not subsidise energy through, for example, feed-in tariffs as this would lead to the inefficient use of a scarce resource. Also, there are challenges with the use of solar energy. It is an intermittent source, and we have limited land for large-scale deployment of solar panels. Nonetheless, we are investing in research, development and demonstration (RD&D) to build capabilities that can support greater adoption of solar energy. The Economic Development Board’s (EDB) Clean Energy Research and Test-bedding (CERT) programme has set aside $16.6 million for Government agencies to work with private companies to develop and test-bed clean energy solutions, including solar, for Government buildings and facilities in Singapore. Another $20 million has been set aside for the private sector through the Solar Capability Scheme (SCS), to offset part of the capital costs to install solar technologies in energy-efficient commercial and industrial buildings. This seeks to build capabilities and encourage innovative integration of solar panels into such buildings. Last year, the Housing Development Board (HDB) announced a pilot solar leasing scheme for 40 HDB blocks in Punggol – Senior Minister of State Lee Yi Shyan elaborated on some of the projects earlier. And under this test-bedding arrangement, HDB supported part of the start-up costs, while the commercial partner designed, financed, installed, and is now operating and maintaining the solar PV installations, offering the Town Council electricity at a rate not higher than the retail electricity tariff. All these efforts will allow us to harness solar energy to its full potential when it becomes a cost-competitive option for Singapore. Mr Speaker: Mr Yee Jenn Jong, keep it short. Mr Speaker: Mr Yee, we are going to run out of time. Mr Yee Jenn Jong: Yes. I just want to know what sort of blueprint we have to develop our local abilities to be able to export our expertise in solar energy installation. Mr S Iswaran: Mr Speaker, Sir, I am not sure whether the Member meant exporting energy or exporting the expertise. Mr Yee Jenn Jong: Expertise. Mr S Iswaran: Thank you, I understand. I just want to elaborate to make it very clear. First, solar as an option for us, we continue to look at it as we do all other energy options because we cannot rule anything out in the context of energy security for Singapore. Secondly, solar energy in the context of meeting Singapore’s basic energy needs has limited potential for the reasons I have elaborated – its intermittency and the large land take that is required to meet our energy needs through solar puts some natural limits on it. Our investment in R&D is precisely in order to develop capabilities in this space. We are working with the private sector through our research institutes. And I think in the long term there will be potential therefore to collaborate with the private sector and to potentially export that expertise. Mr Speaker: Order. End of Question Time. Third, I would like to cover an area I believe will be increasingly important for both Singapore and for the world, which is renewable energy. I think a gap in this Bill is that it does not seek to promote renewable energy explicitly. A comprehensive energy conservation effort must include renewable energy as a component. South Korea is aiming for 11% share of renewables in total energy consumption by 2030. Another heavy energy consumer country, Belgium, is aiming for 12% share of renewables for electricity suppliers in 2012. Japan, the energy intensity of which is comparable to the EU, is aiming for 10% by 2020. Denmark, already a leading energy efficient country in the world, is aiming for 13% by 2020. According to statistics from the Singapore’s Energy Market Authority, in 2010, 79% of electricity in Singapore is produced from natural gas; 19% is from petroleum products, ie, fuel oil and diesel, but only under 3% is from renewables. This gap is made more pronounced by the fact that our National Climate Strategy commits Singapore “to do our part in the international effort to address climate change”. We have promised to play our part by “improving the energy efficiency of our major energy sectors, namely, power generation, industries, transport, buildings and households” and “to the global research effort on climate change and energy technologies”, particularly in solar energy and green buildings. The Strategy states, “The objective of our research efforts … is to improve the current state of technology, and to bring down production costs to a level that would make large-scale adoption commercially viable”. The Government is conscious of the need to signal to the international community our national commitment to the international climate change effort. The fact sheet in this Bill concludes, “Establishing energy efficient standards across sectors under an Energy Conservation Act will also send a strong signal to external parties that Singapore is serious in undertaking mitigation actions to meet its international obligations”. Therefore, I would like to know the progress of our development in using more renewable energy. What are our current plans to significantly increase the use of renewables? I would like the Government to be more proactive to signal to the international community of our commitment to international efforts to address climate change by setting a target of renewables in total energy consumption to be achieved by a specific year. Using the four benchmark countries’ target as reference, how far can we push for a target of, say, 10% of renewables in total energy consumption by 2030? Next, new Industries. I am glad the Government is constantly looking at new industries to develop as the economic landscape is rapidly changing due to globalisation and technological advancement. This is important as Singapore companies continue to seek areas to fill a niche in. One area, I hope the Government can give more attention to, is in renewable energy. Last Saturday, The Straits Times reported energy scenario projections by Shell. The report projected that total energy demand could double in the next 50 years as the world’s population rises to 9.5 billion. In a high energy demand scenario, Shell predicted a strong push for the development of solar power as an alternative source of energy. By 2070, photovoltaic panels could become the world’s largest primary source of energy. Singapore is constrained by small land size. We have been told that even if all roof tops and building surfaces are covered with photovoltaic panels, we could only have up to 14% of our energy needs being met. I think this should not stop us from aggressively promoting and pursuing renewable energy installation expertise and technologies at a faster pace so that our companies can export their renewable energy products and services to fast developing countries in regions hungry for more energy. Our public projects can be more aggressive in using renewable energy. The Government can actively support local companies to build up their abilities to install such set-ups. Just as we had supported local companies to build up capabilities in water technologies to allow them to become global players in this field, we can do likewise now in renewable energy. Mr Yee Jenn Jong (Non-Constituency Member): Madam, it has been some years since the Government identified clean energy as a key economic growth area. Since 2007, the Government has invested $350 million to fund the development testing and export of clean energy solutions. By 2015, the Government expects clean energy to contribute $1.7 billion to Singapore’s GDP, and employ around 7,000 people. It is now 2013, how far are we from this target? We have a dozen tidal wind and solar energy that MNCs largely R&D facilities here but how many sizeable Singapore enterprises have sprung up to export clean energy solutions? Solar power currently represents just 0.1% of energy generating capacity in Singapore. This is very low, and could be the reason why local enterprises have not taken off. We are too focused on development and testing. Germany is the global leader in solar energy production. The German solar energy industry was enabled not just by R&D but also lessons learnt in system adoption and use, because of the aggressive promotion of the alternative energy market. Solar energy capabilities are not just about producing and exporting panels. Clean energy solutions require hardware and software integration, with customisation and after sales services. Without a sizeable local deployment, it will be very difficult for Singapore to export our clean energy solutions expertise. Currently, we only have two small scale schemes for private companies. One to encourage test bedding in Government’s facilities, and the other is to offset the capital cost for installation. We need to scale up system adoption and use in it the private sector to develop the industry and make the market. I propose the Government look into three areas. One, fit-in-tariffs for solar energy producers, selling the electricity back to the grid on long-term guaranteed contract at slightly marked up prices. Two, rooftop leasing to encourage building owners to lease out their rooftops to solar energy companies to produce electricity. Three, solar leasing to encourage building owners to rent panels from solar energy companies. The Government has said that it is not fair to subsidise electricity generation producers. However, the Government provides funding and subsidies in many creative forms to develop promising industries. MTI should study the viability of these schemes and experiment with solar leasing, roof top leasing and FITs.